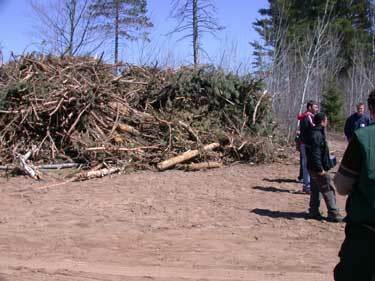 I attended a conference yesterday at the University of Minnesota Cloquet Forestry Center about harvesting, selling, and using woody biomass. In the morning various speakers talked about various topics. In the afternoon we visited a demonstration site on university lands with pictures to follow. Keep in mind that most of the Minnesota harvest at least in the north, is for paper and pulp markets. In an overview, the moderator cited stastics on US energy consumption. According to DOE, in 2000 we used about 100 Quads per year, with a Quad being a quadrillion BTU's. MN cut less than 3 millions cords of pulpwood in 2001 or about 57 Trillion BTU's which is 0.06 % of our total energy usage, if we used it all for energy. Overall in the US it is feasible to produce about 5 % of our needs from woody biomass. Soil productivity impacts and harvesting guidelines. They estimate that normal logging operations remove 50 % of the biomass in the trees. Right now they are recommending that no more than 30 % be removed as woody biomass to maintain soil productivity. In many cases that can be the leaves and small twigs that should remain on site. No one is in favor of two entries into a site with the second one for chipping. I did ask about fertilization needs and apparently there is not much knowledge on the subject. Speculation that any nutrient gain is due to dusts, in Minnesota mainly from Nord Dakota. Other speakers talked about income potential, marketing and sales of biomass, and users of biomass. In general there is not a large income potential right now. I know that MN DNR charges extra if you plan to harvest the residue from only certain jobs that harvesting is allowed. In one county in Wisconsin they charge an extra 20 % of your bid price if you elect to harvest residue. Most loggers believe that chipping the residue is a barely break even operation, and that is if you are big enough to already have a chipper. There is another type of chipping machine being used by some large operations. They use a machine that first has a flail chamber first that strips the bark and limbs and feeds them out one conveyor and then the main chipper makes "clean chips" that are then sold a premium prices. At the end of the job a grinder is used on the bark and limb pile to make boiler fuel. Most of this residue is being sold for boiler fuel and the pulp plants are the primary buyers. Minnesota Power has one small plant that buys chipped or ground residue and even construction wastes that would otherwise be sent to the landfill. They typically are buying on a dry matter basis. One fear is if this biomass becomes too valuable, it will siphon away the pulp and paper mills supply of fiber. Right now that would be a good thing as they are not buying all that is available. There are some small wood gasification operations being built, but they are only efficient if you have a use for year around heat. Now for the tour of the site. This was an 18 acre site that was harvested in November 06. They harvested 209 cords of aspen pulp, 91 cords of birch pulp, 12 cords of red pine pulp, 25 cords of spruce pulp, 16 cords of spruce bolts, 36 cords of fir pulp, 25 cords of maple pulp, 116 cords of red pine logs/poles, and 172 tons of biomass (tops). The total value of the pulp was $10,775 excluding the 116 cords of logs/poles. The residue total was $344 at $2 per ton. Here is the slash that was left from the slasher. This is the equipment used. The grapple loader is nearest, the grinder behind, and the grapple skidder feeding product is behind the loader out of sight in this picture. Feeding the beast. The grapple skidder operator feeds both with the grapple and with the blade. A look at the product in the trailer. This is what's left on the site. They deliberately left the pines behind as seed trees. Most of the larger loggers have migrated to cut to length systems and for now, that method is not very compatible with biomass harvesting. I was asked if it would be feasible to pick up limbs with the forwarder and bring them back mixed in with a load, but I rejected that idea. Wayyy to hard and not economical to both load and sort later. I did get a DVD that has some interesting footage of that John Deere slash bundler in operation, but one of those machines will cost about a half million $. I have some extra copies that I will give to Jeff to see if there is any way of everyone viewing. 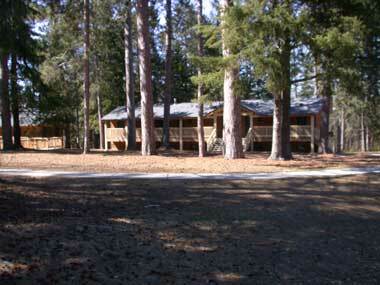 This is part of the Cloquet Forestry Center with some of the large Norway Pines. It's my understand this small area may have escaped the 1918 Cloquet Fire that devasted the area and killed over 400 people. 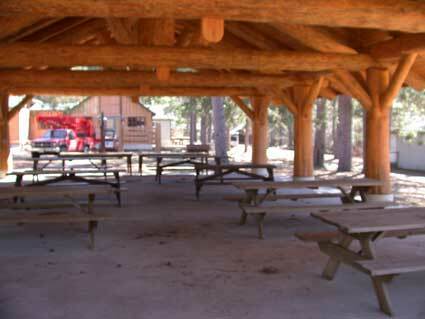 A view of the dining area thru the pavillion that was built with some local Norways. Most of the other people attending were landowners looking for ways to make more income from their woodlands. One of the landowners was worried that this woody biomass would become so valuable that Homeland Security would come and say "we need those three foot diameter Norways for our energy needs." Oh, one other thing I almost forgot. They are also talking about "shearing" brushlands with a special dozer blade and harvesting the woody shrubs. Then these brushlands could be used for growing hybrid poplars or willows for biomass. Northern Minnesota has a lot of presently non productive brushlands and tamarac areas that could be put into production. Basically thats what our operations are doing now, however the economic benefits from sites +/- 100 km from the mill do not warrant paying for the transportation of the hog fuel. I too recently attended a biomass conference in Edmonton and one of the guys from the Dept of Agriculture/US Forest Service from DC was one of the main speakers. I cannot remember his name, but he did have incredible insite. There was also a guy there from Sweden who gave a presentation on the actual harvesting of the debris off the sites, as everything there is apparently delimbed at the stump. Nothing is wasted in that country and they are seeing huge financial gains from practicing this way there. The benefit mills have there is not only much shorter rotations, but the haul distances are dramatically shorter than northern Alberta. Woody biomass could be a good proposition if there were a market. Maybe you guys have markets, but we've been pretty well cut off since the '70s. I was pretty active in the markets from the late 70s to the mid 80s. Coal has undercut the biomass markets, along with the culm markets. Culm is what might be called clinker. It is a mixture of rock and coal. They built generation plants right on the old culm sites and we ended up with too much energy. Of all the biomass projects we looked at, we would always have to find someone who could use the trash steam. After the steam is used to produce electricity, there is a need to cool the steam, and some sort of process is needed. We used it to cook tomatoes at one site. Without that, the economics fall apart. In the 90s, natural gas was the thing to beat. I knew that when they started to build all of those power plants that it was just a matter of time that gas prices would go up and they would become uneconomical. So, what is our current competition? Garbage. I suspect that garbage can be produced a whole lot cheaper than biomass. We already have a couple of trash to steam generators in my area. The public accepts them if they are put a little out of the way. I think its nice to talk about biomass, but until you can attract investors into actually sinking money into it, its just talk. The economics on it is really iffy. Everything has to fall into place in order to make a project float. Of course, things vary pretty much from one area of the country to the next. It may float in your area. This topic is interesting and well timed for me. I have been involved in forest management planning here for about 10 years as a small business logger and renewable resource advisory member. I live in a forest that is dominated by white spruce and heavily infested with bark beetle. Actually off the charts for beetle biology. This area is in a 'lightning shadow' and there have been only a few wildfires since the '40s. We are somewhat isolated from markets and so forest industry is mostly local economy based. Opportunities exist to export but one has to be very careful or shirts will be lost. Quite a few guys have proved this. Biomass energy is one of the potentials for harvest. The greatest proponents are governments(see Ron Wenrich's signature). I've done quite a bit of personal research about this and when linked to a primary forest industry, it seems it can work in the best of circumstances. Non fossil, renewable energy is an attractive idea for lots of good reasons. Government proponents seem to think this can be a stand alone industry(see again, Ron Wenrich's signature). Well, it could be if they want to throw enough subsidy at it but I'm hoping that the ability to reason prevails. Otherwise we might as well sit on the other characteristic that distinguishes us from the other animals and go broke. Now come on you guys that is unfair. I have no idea where the WWF is when they see these type of pictures from up north. If some company leveled the jungle down here like in those photos it would make internatiomal news. Seriously, we have a European company that says they are going to come into this area and harvest beach grass on the Amazon to make bio diesel. They are talking a 50 million US investment. The grass grows about 20 foot tall in the three months that the river is at its lowest. The river goes up and down about 40 feet a year and so they have a short harvest season and I have no idea how it could be profitable running a factory probably a month a year. $344 worth of residue? You can't even move a grinder in for that. 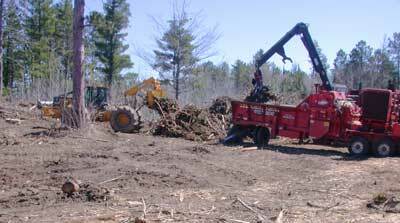 Now, if you are doing some land clearing and all the residue needs removed from the site I can see grinding it to dispose of it, and charging the cost to the landowner. Last week I got to have dinner with a big city insurance executive who knows little about our industry. He asked about what I do with the tree tops on a logging job. I explained that I leave them because number one, they're fertilizer, and number two, they help protect saplings from deer. I guess he had come across a logging job or two in his travels, as he thought all the slash looked bad. He thought that a landowner should be required to clean it up. I told him that if he can find a profitable way to utilize this material he'd be way ahead of most of our industry, and we would be forever indebted to him for his wisdom. Gary, are those Norway pine really red pine? Some people have labeled them as such according to the Dendro book. Sorry I have no comment of the biomass. What I do know is we have a lot of junk wood to supply a Bioenergy plant. 200 loads a week goes from our forests in New Brunswick to supply one in Fort Fairfield, Maine from the closest mill crown licenses. I know one logger that bought a chipper last year and he sends chips on a local Marketing Board contract, 3 or 4 loads a week I think. The site pictured was one of two sites that are university property and part of a study. On the site pictured half of the 18 acres had all residue removed and ground. The other half the residue was left scattered on the site. The second site had three areas that had different treatments. One third was not harvested. 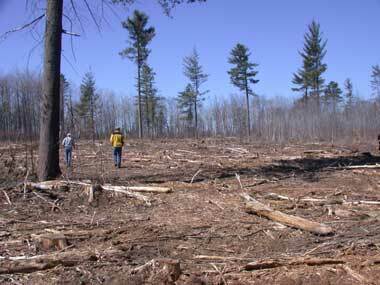 One third had the trees harvested and the residue left scattered and the other third had the biomass removed. Now on this site the wildlife people are setting out live traps to determine the different effects on the lizards, rodents and other feed for the predators as well as the coyotes, hawks, and other wildlife. This meeting was primarily directed toward landowners and so the values given were the return to the landowner. Also, the residue value was only on half of the site so it would be more reasonable the say $688 for the whole site. So overall they harvested 530 cords or 29 cords per acre or 1190 tons which is 66 tons per acre. They did not have the price paid for the pine logs/poles so I can only guess that it was around $40. That would say the land owner got $15415 for the roundwood or $856 per acre and then $644 for the residue or $35.78 per acre. What started my interest in biomass harvesting was when it started being a factor on some of the timber sales I am interested in buying. 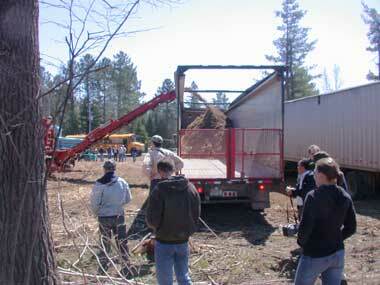 On the MN DNR timber sales which are sold at auction, certain sales have provisions for chipping the residue. Everyone bids on the same wood and then the high bidder can elect to take the option or not. However on some county timber sales, they are sold by sealed bid and if a bidder elect the "whole tree utilization" option they increase his bid value by 25%. I think that increase is ridiculous and cannot imagine how someone can bid that much more for that option. These are predominately cordwood sales, and it is hard to believe you can get 25% more value out of aspen trees by chipping the few limbs and 2-3 inch top. I can see now that biomass harvesting is a huge "bandwagon" and every one is jumping on the bandwagon just as fast as they can. After all, for the research people, there is grant money available for this renewable energy source. The problem is that I just don't see how this is going to work financially. There were no real dollar numbers for the return to the logger at this meeting, but at least for me with cut to length harvesting, it just will not work. That is unless I would buy one of those John Deere/Timberjack slash bundlers. Very informative post. I am enjoying it. In my company's operations, we are running several biomass recovery operations associated with a tree-length harvesting operations. The chipping equipment being used is old, already depreciated equipment. With new chipping equipment, the economics would not be viable. We demo'd the John Deere (formerly Timberjack) biomass bundler in Louisianna, but the cost per ton to produce the bundles (not including hauling cost to the mill), exceeded the price the mill could pay for sawmill bark and sawdust residuals delivered to the mill, so it was not an economically attractive return for the bundler. Maybe things will change, but as of now, most biomass recovery operations suffer from high equipment cost and low productivity making them economically very unattractive. I get a feeling that the pulp and paper mills are somewhat nervous about this increase in interest in biomass. Right now, they are getting some cheap boiler fuel from the few that do chip the residue. However with more interest and competition, the price must increase and may ultimately compete with the roundwood supply itself. There was a landowner that asked what everyone thought was a ridiculous question when he asked one presenter if the value of this biomass got high enough, would Homeland Security come and demand one of those 3 foot diameter norway pines outside the conference center be cut for our energy needs. Obviously that is not going to happen, but the demand could increase the need for more harvesting to fill everyones needs. You are right about the pulp and paper industry seeing the potential biomass boom as a threat to their fiber supply. I have heard it discussed directly several times. The price they are willing to pay as boiler fuel is set by what they can purchase bark and sawdust from sawmills. If bio-fuel refineries go in that are willing and able to pay a competitive price for the same fiber that the pulp mills are using in their process, it will definitely increase the price for all fiber, a bad thing for the pup & paper industry but a good thing for the poor landowners trying to keep their timberland in the face of the tax assessors and the real estate developers. A company recently announced intentions to build a biomass power plant and ethanal production combination plant in our area. I think the power plant will produce 30 megawatts?? of power to supply the ethanol plant. Any excess will be sold on the grid. They claim to be able to burn anything from cornstalks to factory waste. They announced they will use 20 million bushels of corn per year. By comparision, our county produces about 5 million bu per year, but a great deal of our land is not in farmland. My hope is it will operate as they have indicated, and not be a coal fired operation in disguise. I have to wonder what the future might hold here if this plant is built, as far as growing and producing fuel is concerned. If memory serves me correctly, I'm thinking its about 10,000 tons/meg annual consumption. So, your 30 meg plant is going to need about 300,000 tons of wood waste. Another way of looking at it is 46 trailer loads of biomass per day, 5 days a week. That's the equivalent wood waste to about 100 MMbf of production, if you use both the chips and the sawdust. Do you have that kind of production in the area? What's the closest competition? In woods chipping operations here are profitable. The local mills are screaming for product and the slash residue gets ground and sold for boiler fuel unless they have to spread it on skid trails to meet BMPs. We have a bio mass plant about 10 miles from here.There is only one chipping operation that I can think of and he don't do it full time around here.That should tell you how that business is going around here.Probaly 2-3 hour from here on big timber lots it is done,but not around here.I can't think of one chipping operations being done in the last 15 years in my neck of the woods.I contacted the guy above to clear off about 20 arces for me about 5 years ago.He would do it,but I would not get paid a thing.The price was way down. We have the supply here, only thing against it that I can see are the big industry players who want the fibre for pulp. And Irving has a long term contract with the Power Corp (gov corp) for the supply of fuel which is above market price and locked in. So the government, which swings heavily toward Irving, has already mentioned that they intend to build at least one diesel generator, maybe two and no mention of Biofuel from wood residue. I think Boralex (36 MW) are paying US$29/ton for residue. Which is the same price at the pulp mill in Nackawic. We are closer to the 'Fort' as far as trucking. Most of the supply comes from crown and being hauled longer distances, but the royalties are peanuts. The way things were figured back in the '80s was that the utility had to pay you their replacement rate. So, if you were in an area that was using oil, then you had a chance to make it profitable. If you were in an area with mine mouth generators, there was no chance. Coal would beat you pretty bad. Right now, most new money is going into wind. After your initial investment, everything is basically a little maintenance and pick up a paycheck. Not so for boilers. I think there is a market for stand alone generation if you are supplying a small area, like an industrial park. You have a captive market, can use trash steam, and don't have to rely on contracts with the electric companies. These can work, and wouldn't need a great deal of biomass to keep operating. I saw one that used a jet engine concept as the generator and was said to be more efficient than a conventional boiler. The coal mines here in the Maritimes have pretty much dried up. Minto, NB and North Sydney, NS. I found this site with a report about the old coal fields (1917). I don't think this plant can operate just off sawmill waste here in this area. There are still a number of woodworking industries in the area, though. There used to be a sizable amount of waste products coming from them. Far as that goes, we are not that far from some bigger cities- Louisville, Evansville, Indianapolis, that might generate quite a bit of usable waste productsThat may be one area they are looking at. Another area might be reclaimed strip mine land. It might produce switch grass or some other grass. I would personally be unwilling to sell much cornstalks off my land. We need to leave it on the land to prevent erosion and maintain organic material. One of the presenters at the meeting said that most of the coal used in the US has been under long term contracts for 10-15 years. Now many of those contracts are up for renewal and you will see prices for coal go up significantly. The guy from Minnesota Power was asked how much they pay for coal (they pay for the biomass based on the cost of coal) and he declined to answer because it is proprietary information. There is another waste product that has a huge potential for use as a fuel. TIRES Just try to get a permit to burn them!! As far as the woody biomass, they have identified these sources with logging residue being the largest. Residue from PCT isn't feasible. Cost/ton gathering that little stuff would be through the roof. If you attempted it, it would have to be manual labor unless you want to sacrifice some crop trees that would get skun up when traveling with a machine. You probably can't design a machine to cut the stuff like corn and chip it as it goes, wild lands are too rocky and hummocky. I could see using it on aspen stands and going back every 10 years to mow the regrowth. We have a pile of that ground, but it tends to be wet ground, so a tracked vehicle would be needed. The soil would get depleted pretty bad though I would think. Gary, do you guys do much pre-commercial thinning in your area? I don't see any done on woodlots in Maine. But, we thin 100's of acres a year on woodlots here. I'm thinning 500 acres with my crew this year. Strip mines would be better reclaimed to grow hybrid poplar over switch grass. As for biomass source, we always used a rule of thumb of 1 cord of topwood/Mbf of sawtimber. Guys who would be cutting firewood would get this, but there may be more yield if you chipped. I wouldn't want anyone pulling tops to a central landing in an intermediate thinning. Primary manufacturing will come in about 3 tons/Mbf of lumber, if you count chips and sawdust. It holds pretty good for most mills. Interesting that I was looking at some old research papers. I ran across one from the Society of American Foresters entitled Forest Biomass As an Energy Source. Date: 1979. Almost 30 years later, and we're still talking about it. It was a hot topic when I was in school in the late 70's. There was one project called silage sycamore under research at the Univ. of Ga. Some hardwood plantions did get established, but the markets never materialized. Gary, are those Norway pine really red pine? Some people have labeled them as such according to the Dendro book. 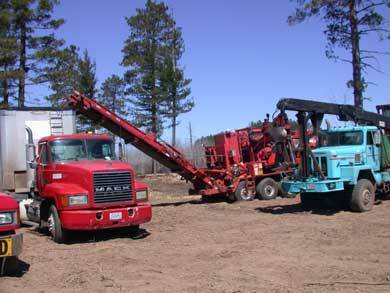 Here in MN and WI red pine is used as a general term for what the pulp and paper mills will buy. That includes norway, scotch, jack, white pine, and even spruce. So most sales will specify pinus resinosa as norway pine so there is no confusion with the mill general term. Gary, do you guys do much pre-commercial thinning in your area? Practically none. It is even difficult to find someone to cut a first thinning on plantation pines so they get more than a little overgrown. The only ones that will do some is the private landowner with his small acreage of woods around his cabin, but even they lose their enthusiasm after the first time. The only other ones to do much is the "sentence to serve" groups that are chosen to keep the buckthorn under control on some state owned lands. And there is no enthusism to start with for that job. I understand the wildlife people do pay some contractors to do some brush shearing and pre commercial thinning for habitat and they are enthused about biomass for energy because it will lower their costs if the biomass is worth something. Yup, my guys have a 'sentence to serve'. It's called making a living. That's funny, but I know the context of your phrase. It's also beneficial for the trees, which is the second reason for this work. That would be incentive enough for me if I owned the woodlot. The following article, published in the Bay Mills News, is a classic example of culturally ingrained misconceptions and lack of clarity in the media. If wood is to be part of the future energy solution, these are the sorts of arguments that we will need to be aware of and deal with. Private non-industrially owned fiber (family forests, moms & pops, etc.) constitutes about 47 percent of the fiber in Michigan. Current forest industry and future forest industry will probably need to tap continually into this supply in order to remain viable. We may even need to increase the supply from these ownerships. A company is planning to put a biomass electric generating plant near Milltown Indiana. You would not believe all the No Biomass Incinerator signs that are going up. One fear is that their will be too many trucks on the highway bringing wood. (We have several rock quaries and a huge underground warehouse that has many trucks per day arrive). The wood hauling trucks would be about 1 every 1/2 hour or so. Another complaint, if you can believe this, fuel trucks might collide with a school bus. (I don't know where that came from but it was in the paper). This would be in one of the poorest counties with one of the highest property tax rates inthe state. I am in the pink when sawing cedar. I've been in counties like that before. That's why they are the poorest and have the highest taxes. They are full of mully grumps that can't see past the end of their nose. That's pretty much like it is where I live. All the big fish are in the small pond. They are afraid if the pond grew they might be small fish. Page created in 1.299 seconds with 40 queries.